HOUSTON, Texas – ATF and the National Shooting Sports Foundation (NSSF), the trade association for the firearms industry, and Crime Stoppers of Houston have announced a reward up to a $12,000 for information leading to the arrest and conviction of suspects responsible for robbing EZ Pawn at 1991 FM 1960 West. 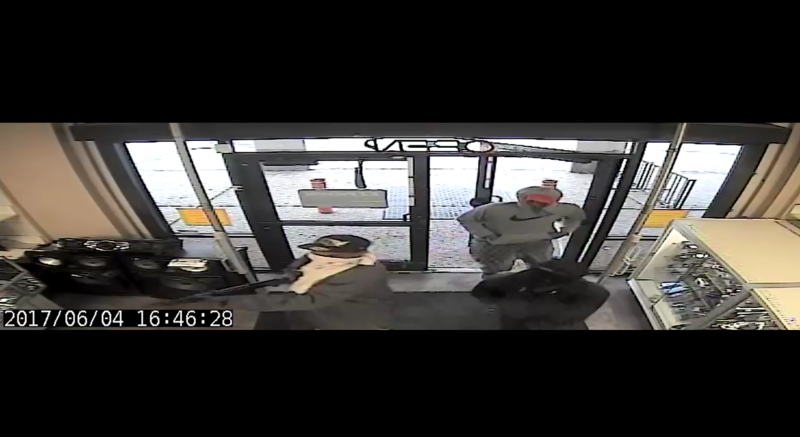 Four black males entered EZ Pawn on June 4 at 4:46 p.m., while the store was open. One of the suspects discharged firearms in the store. The suspects stole 28 firearms as well as cash. Two additional suspects are believed to have been waiting in a white Ford Econoline/E-Series van nearby. Suspect 1 is described as 6’0” 180-200 pounds, light skinned, wearing a black jacket, white bandana with money graphics, and a Levi’s baseball cap. Suspect 2 is described as 6’, 180-200 pounds, light skinned with short black hair wearing a long grey jacket and a dark baseball cap with a white logo. Suspect 3 is described as 5’4”-5’6", 150 pounds wearing Jordan “Concord 11’s” and a red Texans backpack. Suspect 4 is described as 6’2”, 190-220 pounds, wearing a gray Nike hoodie with a large black swoosh, a red hoodie underneath, and gray sweatpants. “The violence shown by these suspects indicate they are not afraid to use guns to achieve their goals. We must catch them immediately in order to prevent further acts of violent crime,” said ATF Houston Field Division Special Agent in Charge Fred Milanowski. Anyone with any information about this crime should contact ATF at 888-ATF-TIPS or CrimeStoppers at 713-222-TIPS. Individuals can also submit information through the mobile ReportIt® app, available both on Google Play and the Apple App Store. All individuals providing tips can remain anonymous.